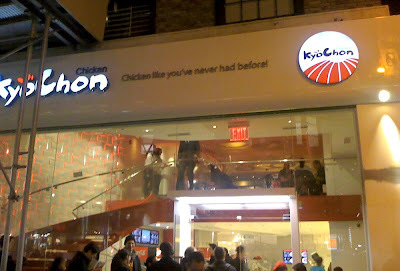 Yes, dreams do come true; Kyochon finally unveiled their new Manhattan location yesterday, March 9th, 2010. Around 7 PM there was already line of about twenty people waiting outside for tables at the upstairs dining room which they also serve beer and wine. Downstairs is a self-service area where you place your order and you are handed one of those vibrating/flashing looking thingamajigs that goes off when your order is ready. 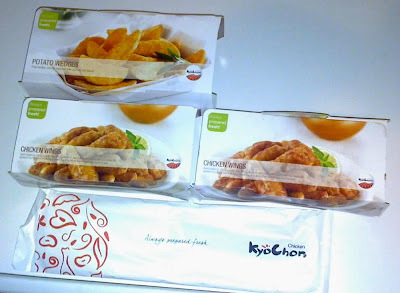 At first it wasn't clear what the outside line was for but two young ladies with their lovely Kyochon uniforms handed me a menu and explained that the line is for upstairs tables only and if I wanted to place an order for take-out I was all cleared to walk in, which I did. I ordered the small (5 pcs.) Hot (Caution: VERY HOT!) and Sweet Signature Wings, small (4 pcs.) Honey Wings (My favorite so far), regular size Coleslaw $2.99 and regular size Potato Wedges $2.99. There are a lot more options to choose from but I thought this was a good amount of food to try what they are known for. 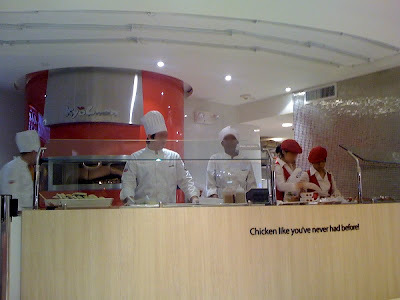 Being that they are located so close to where I live and work, I expect to visit them quiet often, I specially like to try dining at their upstairs room so I can enjoy a cold beer or two with my chicken.